Sibelius’ Symphony No. 5 is one of his most popular masterpieces. The famous horn tune at the end is magical, but even more so is the way the whole symphony builds to this moment. Brilliant young German pianist Lars Vogt is playing Mozart’s sparkling little Piano Concerto in Eb, before which Gardner is conducting Mendelssohn’s well-known depiction of a sea trip off Scotland. Tchaikovsky’s First Symphony is his first really significant work and in it he aimed to depict a series of wintery scenes. Shostakovich’s second piano concerto is one of his most cheerful and popular works. It was written as a 19th birthday present for his son Maxim and packs in an impressive amount of sparkling piano fireworks into its twenty minutes. Ravel’s Le Tombeau was written in homage to the Baroque composer Couperin and presents a Baroque suite spiced up with a sprinkling of twentieth century chromaticism and dissonance. The highlight of this concerto should be the fabulous Nicola Benedetti playing Symamowsky’s colourful abnd fantastical violin concerto, but Brahms’s Fourth Symphony is an undoubted masterpiece, particularly the majestic fourth movement and Haydn’s joyous 92nd Symphony should put you in a good mood from the start! Shostakovich’s last symphony starts of in a light-hearted vein but unlike the Piano concerto from the November concert, there are many more dark moments in this intriguing and moving work. At the other end of the spectrum is Borodin’s famous set of pieces from his opera Prince Igor, which evoke exotic Russian dances. In the middle of this Russian sandwich is a UK premier of a cello concerto by Argentinean composer Osvaldo Golijov, which is inspired by the Baroque concerto tradition. If you got less than a B in any of the anthology questions you will be required to attend workshops as follows. If you are unable, please contact me in advance to arrange an alternative. The Study room is available for private study except for at the following times. 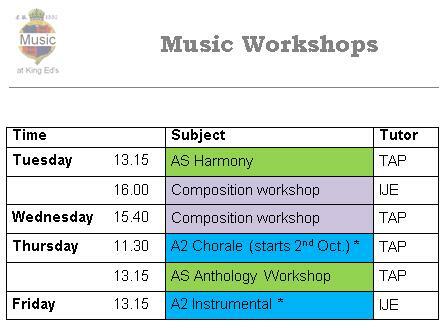 See below for Music Workshop times. Those marked with an asterisk are in C4 (English block) all others are in the Music Room.